Our brains are meaning factories. I just learned this word – Pareidolia – which describes the brain’s way of mashing the messy pieces of the world into a pretty jigsaw of purpose and predictability. 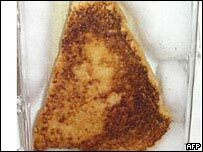 Pareidolia is not only fun, but profitable, at least for the seller of this iconic piece of toast. Sacrifices – the god of harvests loves to see the goat blood get spilled! But he’s only going to be watching the altar on top of that hill, and only once a year. Four-leaf clovers – Why wouldn’t funny plants make things happen? Lucky underpants – The bits that wore away weren’t the parts they drew their power from. 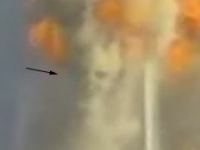 The ‘Truth about 9/11’ conspiracies – a million thousand .html pages of sloppy photoshopping and bad grammar. I don’t read them, because I know I’ll start believing if I do. I really will. Yep, linking causes with effects is built in to our brains – OCD people don’t even need to see effects to come up with causes! They’re sure that all that pacing, hand-washing and stepping between the cracks is keeping them and their loved ones from coming to horrible ends. And don’t even get me started on the causation catch-all, god. A being who moves in ways so mysterious as to neatly mimic the effects of randomness. Finding faces in the sky is one thing, but what really underlines how nuts we are is the Rorschach inkblot test. The mind is able to bend a deliberately meaningless blob on a page to fit the shape of its own truths. And it does this so reliably that an actual science has used it to diagnose disorders. Yipes. Why do some chord progressions and harmonies feel ‘right’, and the rest feel wrong? The brain gets the same positive feedback from a logical argument as from a logical chord progression! This, surely, is evidence that the brain is not fit for purpose. Think you sense a deeper meaning in all the above claptrap? Leave a comment! Previous Previous post: Unsafe is Safe? Next Next post: Intelligent delivery?